Playing ping pong in a group of 22, meandering around islands in kayaks and canoes, gathering around a campfire under a full moon, sharing meals and drinks with a lake view — moments like these enable us to truly connect, engage in honest conversations, build trust, and spark change. This summer, I was privileged to be among a group of community and corporate leaders invited to create and share in these moments in between conversations on building a Canadian pro bono marketplace. Initiated by The J.W. 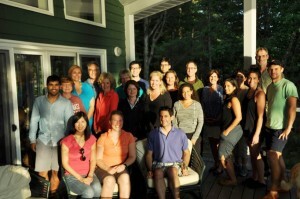 McConnell Family Foundation and facilitated by our friends at BMW Foundation and Taproot Foundation, the conversations on building a Canadian pro bono marketplace were held at Wasan Island in the heart of Muskoka Lakes in beautiful July weather. Wasan Island, owned and operated by The Breuninger Foundation, provides a beautiful setting for hosting retreats that serve as a catalyst for transformative change within society. I was delighted to participate in the four-day retreat focused on building Canada’s pro bono marketplace. It has been two years since I wrote my reflections on the future of pro bono after attending the 2014 Global Pro Bono Summit in San Francisco. Despite Endeavour’s success in running pro bono engagements and the growing interest from companies in partnering with us, the pro bono movement in Canada has been quiet compared to the success of our peers in Germany, Singapore and elsewhere around the world. Without the support of Canadian funders, leaders and collaboration among key players, a large and accessible pro bono market in Canada remains just an idea. Working together, we can create a system in which every non-profit organization in Canada can have access to the talented resources that corporations have to achieve their social missions. Businesses will also benefit from the increased capacity for innovation that professionals will gain through exposure to new ways of thinking and collaborating with social change organizations. This in turn will strengthen the Canadian economy. Taproot Foundation and BMW Foundation, facilitators of the retreat in Canada, have been instrumental in growing the global pro bono movement. Who are the players in Canada’s pro bono marketplace? One of the first group exercises during the session was to identify key pro bono players in the Canadian marketplace and their readiness for pro bono. In the current Canadian market, there are more professionals that are ready to volunteer their skills than there are non-profit organizations that are ready to receive pro bono services. The demand for pro bono opportunities is also growing within corporations looking to skills-based volunteering/pro bono programs as an approach to employee engagement, professional development and corporate responsibility goals. To bridge the gap between the demand for pro bono opportunities and the supply of non-profit projects, intermediaries like Endeavour not only conduct outreach and matchmaking with non-profits and volunteers, but also provide education and supports that build knowledge and readiness for effective pro bono engagements. However, in Canada there are few intermediaries that play this role. Those that do exist are often limited in their capacity to grow beyond their local communities and to collaborate to achieve systems-level change. The Wasan Island retreat was the first time that different key players in Canada’s pro bono market — funders, intermediaries, corporations, non-profit organizations and professionals — came together to talk about how we can build a pro bono marketplace in Canada that is coordinated, scalable and sustainable. While not everyone who can play a key role, such as government, and professional associations and schools, was present, those that were at the retreat represented a broad spectrum of views and expertise that laid a foundation for the creation of an action plan in just three days. 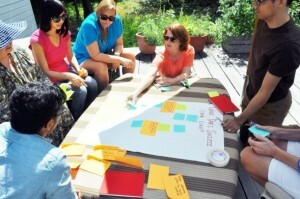 Each of us walked away from the retreat with personal commitments to move the plan forward with specific action items. Having worked in the field for nearly ten years, seeing the energy and engagement among everyone towards a shared vision and commitment for pro bono in Canada was truly encouraging. Community and corporate leaders brainstorm what a successful pro bono marketplace in Canada looks like. Can we build the Airbnb for Canadian pro bono? As with many other services, pro bono may be more readily available and accessible in big cities like Toronto where professionals and organizations are concentrated. It is important, however, that the pro bono marketplace also include those in northern and rural communities across Canada. Technology is a platform through which many businesses and services have been able to scale and reach communities that otherwise may be inaccessible or underserved. The launch of Taproot+, an online platform that matches non-profits with professionals on pro bono projects, was how Taproot Foundation was able to scale pro bono service in the U.S. beyond the cities where its offices are physically located. With online marketplaces like Airbnb, Uber and eBay thriving, building an online pro bono marketplace seems like a no-brainer as we look for scalable models. How can we build a pro bono marketplace like Airbnb that matches supply and demand, offers quality experiences without the high price tags, and which millions of users trust, return to and recommend? Providing a seamless experience for professionals looking to find their non-profit project match based on their skills, interests, availability, geography, preference for team-based versus one-on-one work, and language, will be key. Even more important at the onset will be curating high quality pro bono projects from non-profit organizations. In Canada, there are over 170,000 non-profit and charitable organizations. We need to ensure that these organizations are not only aware of the online platform, but also prepared to post quality pro bono project opportunities and work effectively with their pro bono consultants. Success stories like Airbnb make building an online marketplace look easy, but it is not without its challenges. In Endeavour’s current work, we see anywhere from 10 to 20 times more people sign up to volunteer than non-profits apply for help. 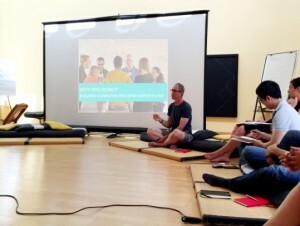 Educating and facilitating non-profit boards and staff on how to develop and post a proper pro bono project scope is just as important to success as the technology itself. Taproot+ and Catchafire — called the eHarmony of volunteering for busy professionals — have led the way in the U.S. Surely, we can achieve something similar in Canada. How long does it take to create social change? Like Airbnb changing the way we travel, building a pro bono marketplace is also about reshaping the way people and businesses in society act. Although over 40 percent of people in working age categories volunteer in Canada (Statistics Canada, 2013), we can assume that most of them are not using their core professional skills and expertise in their volunteer roles. Many companies, except law firms, are still engaging their employees in hands-on volunteering such as planting trees, packing boxes and painting walls. However, we are witnessing a shift — the fastest growing corporate employee engagement program in the US and worldwide is pro bono service (Global Pro Bono Summit, 2016). Instilling the pro bono ethic in professionals may take longer than it took Airbnb to revolutionize the hotel and hospitality industry, but the positive impact it can have in our communities is worth the time and effort it takes to get there. Endeavour and I look forward to being a key partner in the bold vision to build a Canadian pro bono marketplace that promises to strengthen Canadian civil society. Check out photos from Wasan Island Retreat: Building a Canadian Pro Bono Marketplace, July 19-22, 2016 on Endeavour’s Facebook page.